Leo Lightning P.39,596 Leo Lightning, a sorrel stallion, was foaled in 1951 out of Leo and Bare's Pretty Lady. Leo Lightning's offspring numbered 79 registered foals. His performing offspring have included 10 performance foals with a total of 21.5 all-time performance points in Open and Youth events. One Leo Lightning son, a sorrel gelding named Sonny Light out of Skelly by Pinko Natl, achieved an Open Performance ROM in 1968. Dixie Jr. P.98,175 Dixie Jr., an Oklahoma Star bred bay stallion, was foaled in 1958 out of Dixie's Paul and Our Money. 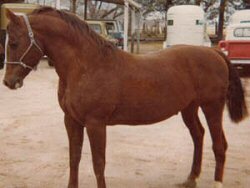 Dixie Jr. was well bred all the way with a top sire like Dixie's Paul and a top producing dam like Our Money, an AQHA Champion. She was Grand Champion Reining mare at the Kansas State Fair as a three year old. 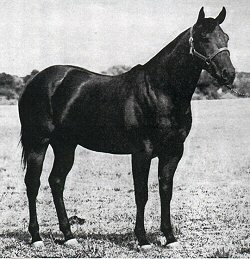 Her half-sister, Ready Money, was the top Cutting horse in the state of Kansas in 1955, 1956, and 1957. Dixie Jr.'s offspring numbered 82 registered foals with a total of 3 performance foals and 2 crops raced: Gay Dell, a bay stallion by Honey Lightning out of Poco Hondo; Dixie Conny, a bay mare out of Conny Lightning out of TK Roany; and Lil Dixie, a black mare out of Lightning Lil by Leo Lightning. Horatio 266,169. 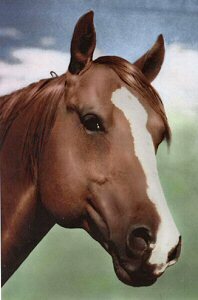 Horatio, a sorrel stallion was foaled in 1963 out of Sugar Bars and Lena Horn was purchased by my Dad in 1964 from Bud Warren. Dad showed Horatio one time as a three year old and he won Grand Champion in Halter. Horatio had a total of 4 performance foals with a total of 25 all-time performance points: Leo Bar Lad, a sorrel gelding out of Fanny Ambrose by Leo Lightning with points in Halter; Fair Hobar, a bay mare out of Jill Lightning by Leo Lightning with performance points and an Open Performance ROM in 1979; Rick's Diamond Bar, a sorrel gelding out of Nifty Rickels by Rickel's Cody with points in performance; and Hobar Dixie Regan, a black gelding out of Dixie Regan by Dixie Jr. with points in open performance and 6th place in Reining at the 1982 Amateur World Show.